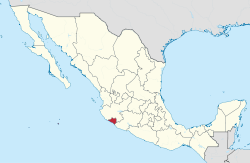 Colima is a state in West Mexico that is divided into ten municipalities. According to the 2015 Mexican Intercensal Survey, it is the state that has the smallest population with 711,235 inhabitants and is the fifth smallest by land area spanning 5,801.75 square kilometres (2,240.07 sq mi). Municipalities in Colima are administratively autonomous of the state according to the 115th article of the 1917 Constitution of Mexico. The legal framework for Colima's municipalities is provided by Title VII of the state Constitution and the 2001 Law of Free Municipalities in the State of Colima. Every three years, citizens elect a municipal president (Spanish: presidente municipal) by a plurality voting system who heads a concurrently elected municipal council (ayuntamiento) responsible for providing all the public services for their constituents. The municipal council consists of a variable number of trustees and councillors (regidores y síndicos). Municipalities are responsible for public services (such as water and sewerage), street lighting, public safety, traffic, supervision of slaughterhouses and the maintenance of public parks, gardens and cemeteries. They may also assist the state and federal governments in education, emergency fire and medical services, environmental protection and maintenance of monuments and historical landmarks. Since 1984, they have had the power to collect property taxes and user fees, although more funds are obtained from the state and federal governments than from their own income. Article 88 of the state Constitution and Articles 11, 60 and 61 of the state's Law of Free Municipalities provide for the establishment of auxiliary authorities (autoridades auxiliares) to represent communities in the municipalities other than the municipal seat (cabecera). These are elected by residents of the communities every three years, and are unipersonal except in rural communities with a population over 2,000 inhabitants, which elect boards (juntas) comprising a president, secretary and treasurer. Auxiliary authorities serve as liaisons between local communities and the municipal government. They do not have executive powers and do not constitute an independent level of local government. The largest municipality by population in Colima is Manzanillo, with 184,541 residents, and the smallest municipality is Ixtlahuacán with 5,527 residents. 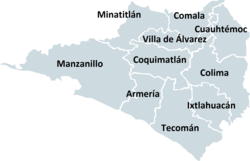 The largest municipality by area is the municipality of Manzanillo which spans 1,361.29 km2 (525.60 sq mi), while Villa de Álvarez is the smallest at 288.69 km2 (111.47 sq mi). The first municipality to incorporate was Colima on June 21, 1823 and the newest municipality is Armería which incorporated June 3, 1967. ^ a b c "Unidad de Microrregiones, Cédulas de Información Municipal (SCIM)" (in Spanish). SEDESOL. Retrieved November 18, 2017. ^ a b c "Constitución Política del Estado Libre y Soberano de Colima". Title VII, Act of November 25, 2017 (PDF) (in Spanish). Retrieved January 1, 2018. ^ a b c "Ley del Municipio Libre del Estado de Colima" (PDF) (in Spanish). Directorate of Legislative Processes, Colima State Congress. September 10, 2016. Retrieved January 1, 2018. ^ Polo Martínez, Humberto (November 2012). Administración pública comunitaria y gobierno local en México: Las autoridades auxiliares municipales (PDF) (in Spanish). National Institute of Public Administration. p. 145. ISBN 978-607-9026-26-4. Retrieved January 1, 2018. ^ Organización Democrática del Cabildo (PDF) (in Spanish). SEDESOL. 2010. p. 13. Retrieved January 1, 2018. ^ a b Estado de Colima. División Territorial de 1810 a 1995 (PDF) (in Spanish). Mexico: INEGI. 1996. p. 67. ISBN 978-970-13-1491-3. ^ "Localidades y su población por municipio según tamaño de localidad" (PDF) (in Spanish). INEGI. February 28, 2011. Archived from the original (PDF) on August 14, 2018. Retrieved July 15, 2017. This page was last edited on 7 April 2019, at 02:05 (UTC).